Every Monday I’ll post a new short story here, based on an image somebody out there has sent me. Welcome to the 52. I held this fifth story back yesterday, as I didn’t want it to get lost in the novel-launching noise around The Flesh Market. For this fifth tale (and can you believe we’ve done five of these already?) I’m collaborating with Andy J C Hannis, who made and sent the fragile thing below. You can click through for a slightly larger version. A woman swoops low over the park, her briefcase clutched tight and her grey suit jacket rippling hard in the wind. She has her hair tied back and one of those disposable plastic visors over her face to protect her from intemperate weather and avian incontinence. So many people can fly these days that you can buy those things over the counter wherever they sell mascara. Her visor reflects the bright morning sun, giving her a face of golden light. I roll my eyes, even though she is majestic. The sleek line she holds as she banks left into the blue glass canyons of the financial district is admirable. I am led to understand that flying in that classic stretched out pose that we all remember from the comic books is murder on the core, and there’s a cottage industry producing specialist Pilates DVDs aimed at toning the deep, long muscles of fliers. You no longer see the unsightly and obese bobbing about on the air like truculent balloons. Self-respect keeps them grounded. I miss them. Their clumsiness made me feel better. You may point the finger and flame my smugness if you choose, but I didn’t have much to be cheerful about in those early days. A runner streaks past me on the park footpath, his legs a kinetic whirl, and I can’t help but wonder what he’s clocking. There are speed limits on public walkways now, but this gentleman doesn’t care. Litter is scooped from the ground by his backdraft, and floats back down like delinquent rain. Two years ago the world woke up with super powers. It took a while for anybody to realise this, because the circumstances in which people might discover that they can shoot ice from their every appendage (the detailed implications of which make me shudder in all manner of ways), or stick to walls, or project their thoughts halfway across the world, are surprisingly few. It took weeks for anybody to discover that they could leap tall buildings in a single bound, because nobody was really trying to. Of course, after the first few manifestations, people experimented. There were many comical deaths. I’m sorry, that’s harsh, but you must have laughed too. Fantasy and reality got mixed up, and people made rash assumptions about which super power they probably had. Many threw themselves off buildings, only to have the ground explain to them in the crudest of terms that their new ability was not flight. I was as excited as everybody else, or course. I couldn’t wait to discover what my super power was. I was due a crushing disappointment. I used to live in a lovely modern apartment, back when I was an accounts manager – a sunlit cream and chocolate luxury. You would have been impressed by it, I hope. After all, that was what it was designed to do. Like the rest of my life, it was a shallow farce. I understand that now. Still, I’d love to have that apartment back. Look at where I live today. A tiny one bedroom in a grey block that looks more fused than built. All that saves it from being a slum is the lack of malice among the inhabitants. It’s a polite downfall of a place, where many of us with less than dazzling abilities have ended up. Next door to me lives sausage-eating Dave. He has the ability to consume as much as he wants without gaining weight, as long as it’s sausages. Not much of a power, but one he has embraced. It makes him abominably flatulent, which may explain his slide down the social hierarchy and into purgatory. I can smell him, as I walk up the dark stairwell to the third floor, and as I slide my key into the flimsy lock I hear the boom of gunfire through speakers. He likes to play explosive console games while he eats his endless sausages. My super power is the worst one in the world. There has been no poll or investigation to back this up, but I remain confident in stating it as a blunt fact. Nobody has a super power so pointless and irritating as mine. I have the astonishing ability to slightly manipulate paper. I can thrust my life force into a piece of paper, and make it move a bit. Needless to say, I have not been driven to use my powers for the good of mankind. The side effects make things worse. For a start, it turns out that life force is a finite resource. Animating one sheet of A4 paper, perhaps to have it fold into a bird and fly around the room, exhausts me. A ream of A4, a flock of paper pals, might even kill me. It wasn’t just having a useless super power that brought me to where I am today. My new affinity for all things paper comes at the cost of the electronic. When I approach a computer, it fizzles and dies. Mobile telephones give pained squeals, and also die. I went to the supermarket last week, and the sliding doors went berserk as I approached. First they stopped midway through closing, and then they started to slice open and shut at breakneck speed, like glass jaws. Everybody stopped and stared. I made an embarrassed retreat before they realised it was me. There’s a corner shop at the end of the street that still has a brass bell above the door, and more importantly, a manual cash tiller on the counter. If it wasn’t there, I wonder if I might have starved to death by now. I was a bit of a jerk in the old days. An alpha male. A prince of my little domain. I don’t miss it. I lost my job just a few days after the public announcements about super powers. Until then nobody realised that the daily failure of the IT in my office was entirely down to me. Only I suspected something wasn’t right, because exactly the same thing had happened to all my gear at home. As soon as the link was made I was shuffled out of the door with a reasonable package of cash and benefits. They couldn’t fire me, as it was beyond my control, but they couldn’t afford to keep me either. I haven’t worked since then. With no telephone and no computer, I lost track of the people who I had called friends. They didn’t make much of an effort to find out why. I wasn’t in their network anymore, so ceased to matter. For the most part it’s no great loss. With the exception of Michelle. I miss Michelle. When I was an alpha male she worked alongside me. I did the statutory office wooing, being careful to stay the right side of sexual harassment, and had her ripe for the plucking just as my life turned upside down. My plan was to bed her and see how things went from there, but I never got that far. I didn’t understand that I was in love with her until after I left. It was perky, happy Michelle I kept thinking of as my life flushed away, but I’d left it too late. Since I have been off the network she has found other alpha males to dally with. She likes drama and big gestures. At the moment she’s sharing a bed with Kevin, who at one time I would have called my best friend. He has the ability to shoot fire from his hands. That’s just the sort of thing that does it for her. Everyone believe her to be shallow, but that’s not what I see. I recognise that she’s needy enough to seem shallow, which is different. She hangs herself on the wrong men because she has no self-respect. You would see a difference in her if she had somebody who has learned what’s really precious in life. What she needs is me. You’re looking at the piles of neatly torn paper piled around my threadbare couch in confusion. Yes, I’m going to animate them all. Yes, it’s going to kill me. But not for long. Don’t worry. It will work out. Before that, I need to get writing. A different word on each piece of paper. A different shred of love. You know that feeling you get when you understand how much your life will change if only that one special person chooses to join you in it? It’s a syrupy sort of hope, that congeals in your guts and loins like golden tar. If it builds up for long enough it makes you do crazy things. I went to see her once, to tell her how I felt. I had an idea that she would melt to hear it, and my life would take its new form. I would not remain for long in the polite slum I had descended into. I would rise, with Michelle buoying me up. She would be my awesome super power. She left the building by the ground floor, which was a relief. Whatever her own ability was, she was not a flier. As rush hour – a bouncing, sliding, leapfrogging cacophony these days – blossomed around us, I braced myself to say hello. Marching towards me on lethal heels, she looked me in the eye, then walked right past me. Many variations of the conversation we would have had played out in my head as I waited. It had not occurred to me that she would have no idea who I was. I turned to stop her, and that was when I discovered her super power. Michelle was an invisible woman, and I had lost my chance. There. Done. Big gestures. Huge statements. This is going to work. I’ll leave the bits of paper, so many that I lost count an hour ago, on the floor. I have cramp in my hand, but that’s okay. It won’t hurt for much longer. There have been fewer suicides since the powers were passed out. I think it has to do with the potential. Even after so long, everybody is still trying to work out what the world might become. It’s an exciting time. So here I am, on the bridge. A classic scene. It’s raining and dark. I’m on the edge, staring down at rocks and water. No suicide note for me though. That’s not what we’re about. If something goes wrong then there are all the one word slips back at the hovel to sift through, like a massive jigsaw of possible motivation. Whatever conclusion they draw about me will be wrong. I am hopeful that this all moot speculation, of course. Right then. There’s no point standing here chatting. I can’t move on until I jump off. I’m looking forward to the next bit. Well, not the very next bit with the rocks, but after that. See you in an hour or so. I’m outside her house now. The pain is over. This is what happened. I thought I would drop straight down, but instead I tumbled. I lost track of what was beneath me and what was above, and in the end my timing came to nothing more than guesswork. Gathering up my life force, I pushed before I hit the water. I felt the simultaneous crush and splat of flesh and bone when I hit, but then everything was dark so it wasn’t that bad. A few moments after I died, the scraps of paper in my room started to twitch, as though a gentle breeze was playing at their edges. That was me. My life force. After a tease of seconds, they folded, then folded again, then flipped, and folded, and tucked, and folded, until every one was a tiny butterfly made of paper and ink. Wings twitched in the darkness, sensing possibilities, and they took to the air in a whirling rabble. I had left the window open, and they found the night. I was in them, but I wasn’t really in charge. No single paper butterfly held enough of me to form a coherent thought, and they dispersed across the sleeping city. They landed on roofs, and spiralled around lamp posts. Some made their way into people’s houses, lighting briefly on furniture before moving on. They made people gasp, either in wonder or panic. I lost some to clapping hands and stamping feet, but enough survived. When I pushed, I gave them one overriding instinct. While it took them some time to act on it (I should have chosen something less playful than butterflies, more driven), they finally assembled in a great flutter above Michelle’s block. As the last survivor joined them, they glided down to the ground and began to twist and shape themselves. Now I am frozen in place on the street at the bottom of the stairs to her apartment, an origami man with arms outstretched, welcoming the golden dawn. I did not condition them to make me paper muscles, but that’s something I can deal with later, when new supplies present themselves. I am hoping there might be a paperboy on the way, ready to throw down the morning edition. That’s all I need to get me started. A big gesture. The biggest. All my words and love, wrapped up in me. Others have the power to make dramatic statements, but only I have become one. An older lady making an early run for the train stopped beside me earlier. She read a few of my words and rewarded me with a honey smile of hope. Now it’s raining a little, although the sun still shines. You would think that this would worry me, but I am not concerned. I had considered the possibility, and tested my power against it. I can hold together if I get wet. The door opens, and she steps out. Kevin is right behind her, but he won’t matter in a moment or two. All she has to do is read me. I really want to intervene now. I feel there might have been a misunderstanding. “Done,” says Kevin, and he points his finger at me. I remember what his super power is, just as his fingertip begins to flicker with flame. Andy J C Hannis writes children’s stories, ride bikes fairly badly, and works more hours than should be considered reasonable. Like Henry the janitor, he is also a mild mannered undercover superhero. Which brings us to the end of this project’s fifth entry. Already, we’ve put together enough fiction for a new reader to have a new story every lunch hour of the working week, which is nice. If you enjoyed ‘Paper Cuts’ and think it should be read by more people, then please share it. Nobody will ever find it unless you do, and there are handy buttons below for just that purpose. Also, I don’t yet have enough images with which to do this for a full year. If you have cool pictures that you would like to send along as inspiration for a story, please let me know. Details are here. Next week we’ll be back in the usual Monday slot, possibly with a story called ‘The Pink Tower’ (though I’m a little undecided about that one just now – we’ll see). I’ve been nudged by a few people to put a ‘Donate By Paypal’ button at the bottom of these posts, but I’m not going to (I appreciate the thought though!). This isn’t a commercial thing, and doesn’t need financial support. It’s just me, you, pictures, and words. However, if you really feel that you want to support my writing, or the publishers that I’ve worked with down the years, just buy a book one of the times you swing by. My new novel The Flesh Market is a good place to start with my longer fiction. If short stories are your thing, and you enjoyed ‘Paper Cuts’, then you might also like my story ‘The Devil’s Children’ in Storyteller – A Found Book. Gosh you REALLY are a unique writer Richard. Another gem!!! Just -Thank you for the trip into your amazing world. Pure genius! 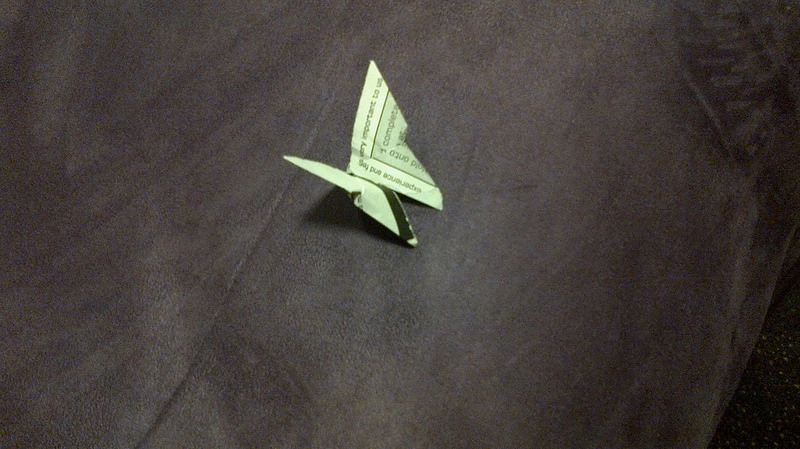 How you go from origami butterfly to that is, as I just said, pure genius.